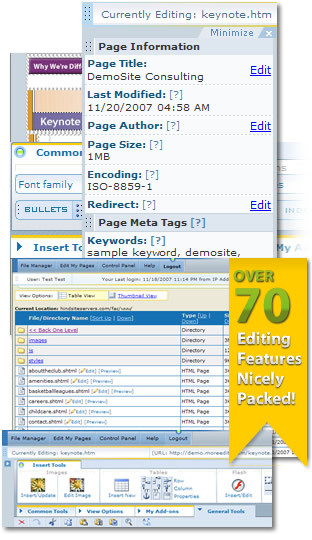 Web Content Editing Tool for editing your web site. How Do I Easily Edit My Web Site Pages? Baltimore, MD., October, 2007 – HindSite Interactive, Inc. a leading web site development company based out of the Baltimore , Maryland area has announced today the launch of Easy WebContent . Easy WebContent is an online web based application that makes updating and editing web sites available to anyone who owns or has a web site – easy. The program is available online and it works with nearly all HTML based websites. Now it doesn't matter who originally created or designed the existing web site, with Easy WebContent anyone, even non-technical folks without prior web experience, can learn to update, edit content, or add new web pages. Easy WebContent will be your teacher with it's easy to follow instructions. “We believe this tool will transform the web site industry by helping businesses manage their online business quickly and more efficiently,” said Payman Taei, HindSite Interactive's Director of Operations. “In today's online world, companies expect their web site content to be up-to-date, but the reality is that sometimes this task can be delayed by waiting for the web developer or designer to make updates. This can take days or even weeks and is costly as most designers charge by the hour. With Easy WebContent, virtually any business can use this online tool and see the web site change immediately and the user doesn't need to be trained in web development or web design,” said Mr. Taei. Easy WebContent eliminates the back and forth of reviewing with a third party such as a web designer or web developer plus the program works with all standard browsers and operating systems including PC's and Mac.